•Support for aging people with cancer, diabetes, high cholesterol, drug toxicity, etc. A natural Chinese supplement, cordyceps benefits several body systems, including the circulatory, immune, respiratory and glandular systems. 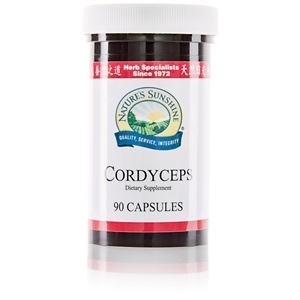 Cordyceps offers energizing support and is traditionally used to help the body build strength, endurance and stamina. Take 2–3 capsules with a meal three times daily. CAUTION: Cordyceps is safe for adults, but people using immune-suppressing drugs, anticoagulant drugs or bronchodilators should consult their health care practitioners before using this product. Pregnant or lactating women should avoid using this product. Store in a cool, dry place. 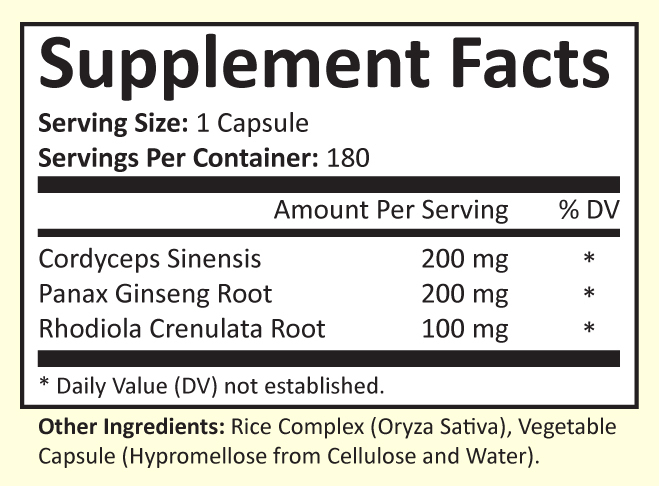 Cordyceps Plus contains a unique blend of Cordyceps Sinensis, Panax Ginseng, and Rhodiola. Each vegetarian capsule contains 500 mg. Suggested Use: Take one capsule three times per day with meals or as desired. Coping with life's everyday challenges can sometimes get the best of us. Particularly, if our health is not as robust as it should be. Researchers believe that the high stress of today's lifestyles is likely the major factor causing premature aging and chronic health problems. Three dietary supplements that seem to help offset some of these negative consequences are Cordyceps, Ginseng, and Rhodiola. Cordyceps - Cordyceps has been used in Traditional Chinese Medicine (TCM) to treat fatigue and other ailments for over 1500 years. Modern researchers have found that Cordyceps seems to help improve respiratory and heart functions, reduce kidney and liver conditions, support the immune system, increase energy levels, and enhance sexual function. Cordyceps contains many amino acids, minerals, vitamins, trace elements and its own unique active compounds such as adenosine, cordycepic acid, and polysaccharides. Adenosine is an energy carrier that helps support the transfer of energy throughout the body. Cordycepic acid seems to improve circulation. The polysaccharides help boost the immune system. The Journal of Pharmacy and Pharmacology, December 2005 issue, published a Chinese study suggesting that the polysaccharides in Cordyceps had antioxidant and anti-inflammatory properties. Also, Cordyceps may have a positive effect on memory, appetite, and sleep patterns. From a nutritional viewpoint, Cordyceps is a well-balanced nutritious whole food. Ginseng – Of all the ancient remedies, ginseng is perhaps the most widely used. It has been used in Traditional Chinese Medicine for thousands of years as an herb to treat and prevent a wide variety of human ailments. In early Chinese medicine texts, ginseng is classified as a "superior" herb due to its ability to promote longevity and vitality. Ginseng is considered an adaptogen for its ability to help the human body increase its resistance to chemical, physical and biological stress while helping to improve general vitality (both physical and mental). The three major varieties of ginseng are Asian ginseng (panax ginseng), American ginseng (panax quinquefolius), and Siberian ginseng (eleutherococcus senticosus). Of these, the Asian ginseng or Panax ginseng is native to China and Korea and is one of the most widely used herbs in the world. Ginseng has the unique ability to be bi-directional. It can either simulate or relax depending on what the body needs. It helps bring the body into balance. The major components of Panax ginseng are ginsenosides which seem to have several positive health benefits. Several clinical research studies concluded that Panax ginseng appears to provide positive improvement for the central nervous system, cardiovascular system and endocrine system, immune system, and helps reduce stress and slow down aging. Other studies showed 1) improvement in performance of athletes, 2) enhancement of mental performance, learning time, and memory, 3) lowering of fatigue and stress in chronic cases, 4) normalizing of blood conditions, and 5) improvement of sexual function. Rhodiola – Rhodiola crenulata, also known Crenulin, Arctic root, or Golden root, has been used for centuries in Asia, Eastern Europe, and Scandinavia. The root of the plant was used in traditional folk medicine as a remedy to improve endurance and productivity, prolong life span, lessen high altitude sickness, improve gastrointestinal ailments, lessen fatigue and depression, and support the nervous system. Recent research on Rhodiola has documented several important health benefits for the human body. These possible benefits include enhanced use of oxygen, strengthening of the heart due to improved oxygen use, enhanced absorption of nutrients, reduction of stress, and positive antioxidant effects. Rhodiola is commonly referred to as an adaptogen due to its ability to help the human body adapt to physical and mental stress and still maintain general vitality. In Russia and China, Rhodiola has been used to improve physical strength and mental clarity by athletes, astronauts, and others in oxygen critical environments. Rhodiola seems to support and stimulate the body's immune system in two areas. First, by stimulating the creation of Natural Killer Cells which destroy infected cells and by helping increase the body's resistance to toxins. Second, by helping the body cope with stress. Researchers believe that stress weakens the immune system and lowers the body's ability to fight attacks from bad bacteria or viruses. And, over time this can result in a decline in one's health and vitality. One final thought on Chinese herbs; they work slowly to help the body achieve balance and address the issue(s) most critical to it. So, be consistent when taking them and have patience as you observe the changes to your health. These three Chinese herbs have a long history of helping improve a myriad of health conditions from enhancing appetite to reducing stress. They are certainly worthy of your consideration as you seek solutions to improve the quality and longevity of your life.